Caesar Salad Slots is one of the FUNNIEST 5 reel 25 payline Cryptologic bonus video games released in November 2006. Apart from the eye-catching bright design with AMUSING cartoon images of ROLY-POLY Caesar and others, the game features $75,000 Top Jackpot, 10 Free Spins, wild and scatter symbols. 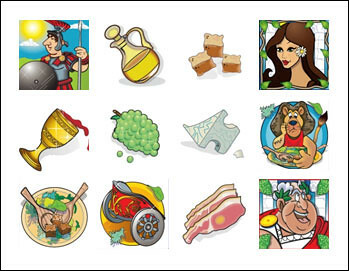 Vivid style will definitely improve your mood as you spin the reels and see animated Guard, funny Lion, Chariot, delicious Caesar Salad, Wine, Grapes, fatty Caesar, attractive Caesar’s Wife, Meat, Cheese, Croutons and Vinegar. The symbols of Caesar Salad constitute 40 winning combos. 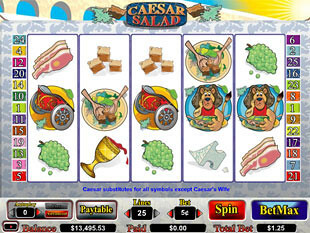 The highest Caesar Salad jackpot is 7,500 coins or $75,000 for 5 Caesar symbols. The second Caesar Salad jackpot is 2,000 coins or $20,000 for 5 Archeologist symbols. The third Caesar Salad jackpot is 1,000 coins or $15,000 for 4 Caesar symbols. FOOD ADDICT Caesar is a wild symbol. Yeah, he wildly swallows a drumstick once you catch him in a winning combo. Caesar substitutes for any symbol except his Wife and constitutes more winning combos. 5 icons of the great emperor will award you the CRACKIN’ $75,000 JACKPOT. Apart from the first jackpot, Caesar will award you the third top jackpot worth of $15,000! PRETTY Caesar’s Wife is a scatter symbol. She will kindly help you collect CRASH HOT prizes! Catch 5 Caesar’s Wifes and get 100x total bet Multiplier. Add to your bankroll the maximum scatter prize of $4,500. If Caesar’s Wife appears on the reels 4, 3 or 2 times, you will be awarded 10x, 5x, 1x Multipliers. 3 or more scatters will make your way to 10 Free Spins feature. The Lion is a solid king of animals, but in Caesar Salad he is a SCREAM. That’s right this goofy-looking animal will make you scream once you see it on the reels. 5 Lion symbols will bring you the ROKIN’ $10,000! And that’s only the general payout! Free Spins Feature. Scatter 3 or more Caesar’s Wives and win 10 Free Spins! The free games will considerably contribute to your bankroll. You won’t need to wager a single penny but you can win large prizes at the same time! Free Spins feature can be retriggered any time. 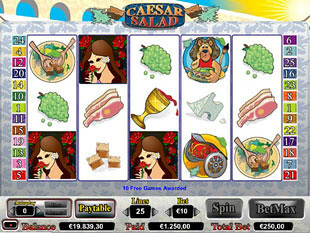 Playing Caesar Salad you can also set any amount of auto spins. Click Advanced button and make the necessary settings. You can use up to 999 auto spins. 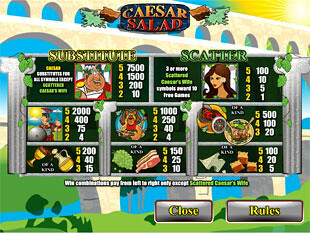 Caesar Salad slot machine is so lively and rich in payouts that you won’t keep from smiling while playing it. 10 Free Spins will rock your bankroll, $75,000 Top Jackpot is surely enough to make a trip to Rome to try the original Caesar salad!